Iron Fist is a Marvel Super Heroes minifigure released in 2012. 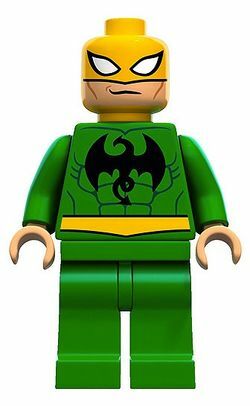 Iron Fist has unprinted green legs. He has a green torso with a horizontal yellow sash at its base and a black dragon printed on it, as well as green arms, and flesh coloured hands. His face is partially flesh, and that section is printed with a confident expression, but he wears a mask over his eyes, making the top of his head yellow. He has back printing showing the suit's cut on his back and the continuation of the yellow belt. Daniel "Danny" Rand was the billionaire owner of his father's company, the Rand Corporation. He was born and raised in the mystical city K'un L'un. and beat the mystical dragon Shao-Lao, gaining the Iron Fist. He was given a year to give up his earthly possessions, say his goodbyes, and then become the king of K'un L'un. Instead, he became a hero, the Iron Fist, and accepted to be trained with S.H.I.E.L.D. under Nick Fury with a team consisting of Nova, Power Man, White Tiger and was originally led by Deadpool, who later left S.H.I.E.L.D. and was replaced by Spider-Man. As a member of the team he fought villains, such as Doc Ock, Dr. Doom, Venom, the Lizard, Sandman, Electro, Kraven the Hunter, the Rhino, the Green Goblin, Carnage and Beetle. During Nightmare's spell, Danny revealed he felt he didn't deserve the power given to him. When Peter Parker was turned into Carnage by the Green Goblin, Danny took over the role of Spider-Man to avoid suspicion. When Scorpion, who desperately wanted the throne of K'un L'un, attacked Iron Fist to stop him from from returning to the city, Danny was brought back to the city,as his year was up. Spider-Man followed him, as he refused to let this happen to his teammate, and Danny vouched for him. Danny had to compete with Scorpion in the Return of Shao Lao for the title of king. However, a poison Scorpion had infected Danny with earlier had blinded him, and Rand chose Spider-Man to represent him. Spider-Man managed to win the competition through his humility, but Scorpion tried to kill to Spider-Man. Iron Fist defeated Scorpion, while unlocking his second fist, and Scorpion was exiled. Impressed by his and Spider-Man's feats, the head monk gave Rand one more year. In LEGO Marvel Super Heroes he appears as a member of Heroes for Hire alongside Power Man. In Ultimate Spider-Man he is voiced by Greg Cipes, who also voices Michelangelo in Teenage Mutant Ninja Turtles. Imbued with a dragon’s mystical energy, Danny Rand can focus his chi to grant him incredible martial arts abilities. His laid-back attitude hides a sharp and serious focus on important tasks. He trains hard to master his abilities and become the best super hero he can be. This page was last edited on 22 February 2019, at 19:57.